Alexander Der Grosse - Follow in the Wake of Alexander the Great, buy Settlements from him and vie for his favor. The map for "Cheops" corresponds to the historical and geographical conditions of the time. Each player represents an Egyptian family. First, the players build roads, ships and settlements. The Pharoh soon expresses the desire to build a large pyramid. But that is not simple. Egypt is richly blessed with wool and grain from the Nile deltas and quarries in the south, but wood and ore must be imported. These will come from the productive ore regions beyond the Red Sea and the forest-rich areas of Palestine. With sufficient gold, however, a player can buy what they cannot produce. The player, who contributes most stones to the building of the pyramid, is richly rewarded by the Pharao. Quite the opposite befalls the players who contributed fewer stones. 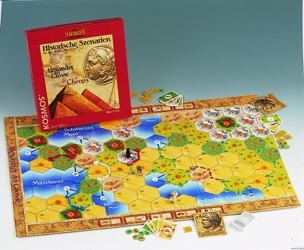 Only the rules and the box are In German, English Translation provided. Ownership of either MFG0483 or MFG0568 required for play. This game utilizes the cards from your Settlers Game, and your wood pieces. Everything else is supplied. 1ea 2 sided mounted mapboard 2 die cut counter sheets Special rules For 3-4 players.